The basic story: There's been a long standing scientific problem with how sustainability metrics have been defined. We've been doing sustainability assessments by "counting up" the parts we could find... instead of by "dividing up" the totals. The latter approach can capture 2 to 10 times the impacts that the former approach was leaving uncounted. An environmental impact is a very diffuse global effect, something every business contributes to globally with all its materials and services chains, with both employee and technology impacts of great variety, literally scattered around the world. Without lifting a pen you can be sure that "on average", every business will be responsible for a share of the world economy's impacts proportional to its share of the world economy. So, an accurate accounting of material responsibility for impacts needs check what direct impacts you can find to count, and as if just to "check the math" compare that to the average world environmental impact for its share of the world economy. That's how physical science measures are designed, with defined units that are defined fractions of a scale. Using that approach results in a far more accurate accounting. The 2011 paper was in the online journal Sustainability, and as a local PDF. In 2014 a generalized version was developed for discussion at the UN's meetings on Post2015 Sustainable Development Goal, called A World SDG, as a practical system for "internalizing all direct externalities". It would, conceptually, assure fair global accountability for the impacts of all kinds of economic choices, by businesses, consumers, investors and policy makers. to be compared with the business financial balance sheet for a net gain or loss to society, and share of responsibility for our future. It would help inform decision makers on true relative benefits and harms of their choices, and so improve long range investment and policy choices. The Oil Man helps explain the "reality math"
What’s “Scope 4″, and… Why all the tiers? ?, How full is a “Glass Half Hidden”? Published review article in Sustainable Brands as Shining Light on “Dark Energy": the total impacts of Business in Nov 2012 "New Metrics of Sustainability" collection. The standard measures of business energy use, like LCA, count energy uses paid for as costs of employing technology in business operations, but do not count the energy needs of the self-managing services businesses need to employ too. A business's self-managing services don't record or report their energy use, so a choice to count only reported energy use is a decision to omit the great majority that go unreported. Those include the energy uses paid for as a cost of employing labor, management, design, advertising, maintenance, Insurance, finance, rent and taxes, etc, all of which generate "consumption for production" costs as necessities of operating a business. 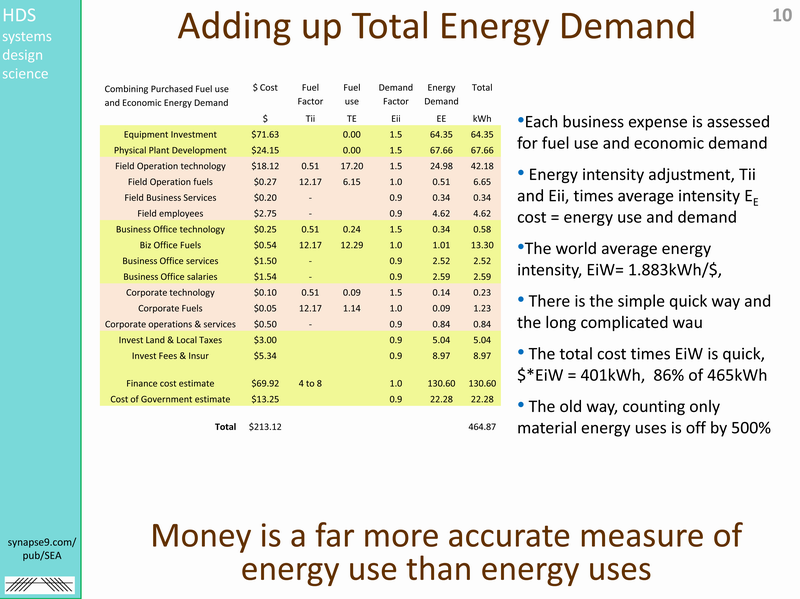 A method of combining the reported and unreported energy demands is needed to get an accurate total. The systems physics needed may be the more important finding in the end. 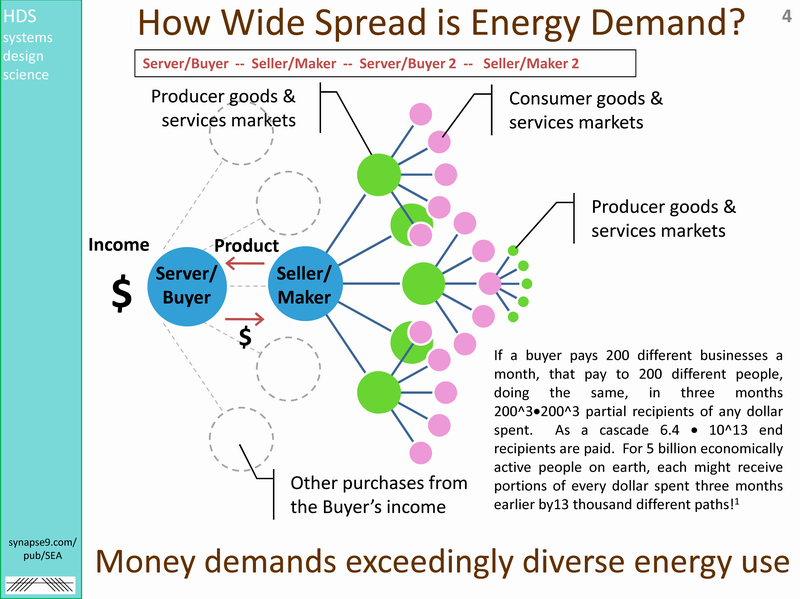 To decide what "unreported" energy uses to count it relies on identifying the natural physical boundary of a whole working unit of the economic environment. It may be the first attempt to objectively fit a scientific measure to the natural physical boundary of a whole distributed net-energy system, a natural unit of environmental organization that grows and behaves as one. Identifying "a business" as a working unit of organization in nature, (as a self-defining object) departs from treating it as a theory of equations representing recorded data . That creates a whole new subject for physics, as well as for economics. 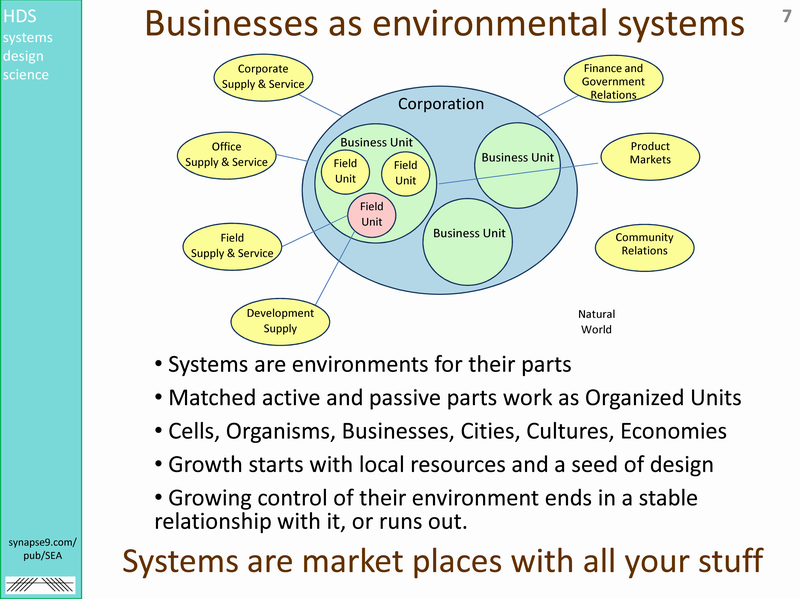 Environmental systems become physically accountable net-energy systems, as having a natural boundary and subject to traditional thermodynamic analysis. So it allows them to be studied in their organic form, rather than as theoretical models missing unknown amounts of the energy information needed to close the equations. 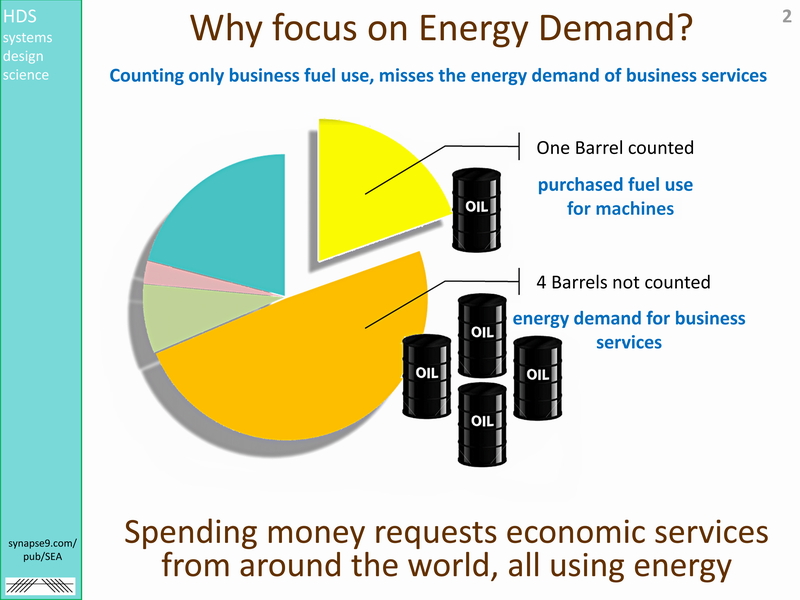 The world standard method for counting the energy use of businesses, following the ISO governmental standards, as applies in LCA and GHG measurements of environmental impacts, count the fuels purchased for production goods but not the fuels purchased for production services. This is the difference it makes, a change of ~500% in the scale attributable business energy costs and environmental impacts. 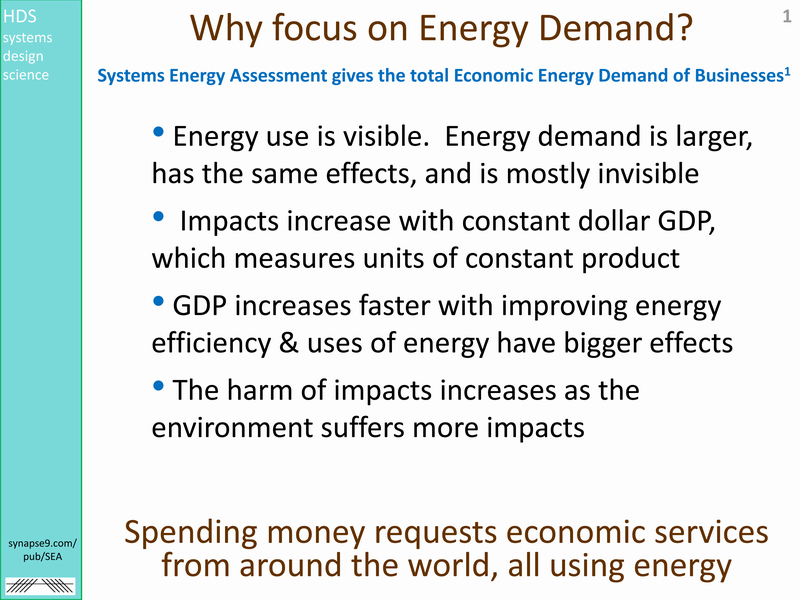 Presentation: Why Focus on Energy Demand? 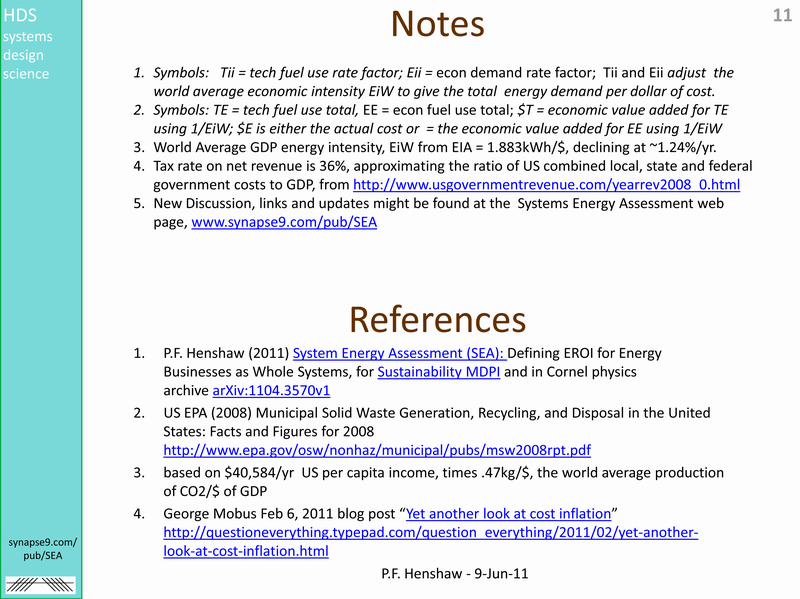 Google search for the title - "Systems energy assessment"
Blog with related subjects - "Reading Nature's Signals"
An ideal Model for an global information network to inform all markets and communities on the true value of their choices. So, for the measures of individual impacts the problem of how to estimate the impacts of its purchases of services that go uncounted has just been ignored, appearing to be a necessity. Unaware that ignoring the individually untraceable portion of business impacts would make impact measures scientifically indefinable, and so not valid as physical measures. What it's been hiding are errors in impact estimates on the scale of 80% or more (basic findings). I’m the systems scientist who got to the bottom of it, starting with a way to give environmental impact measures a well-defined uncertainty, and demonstrating a practical method using currently available data to generally apply it to sustainable design problems. 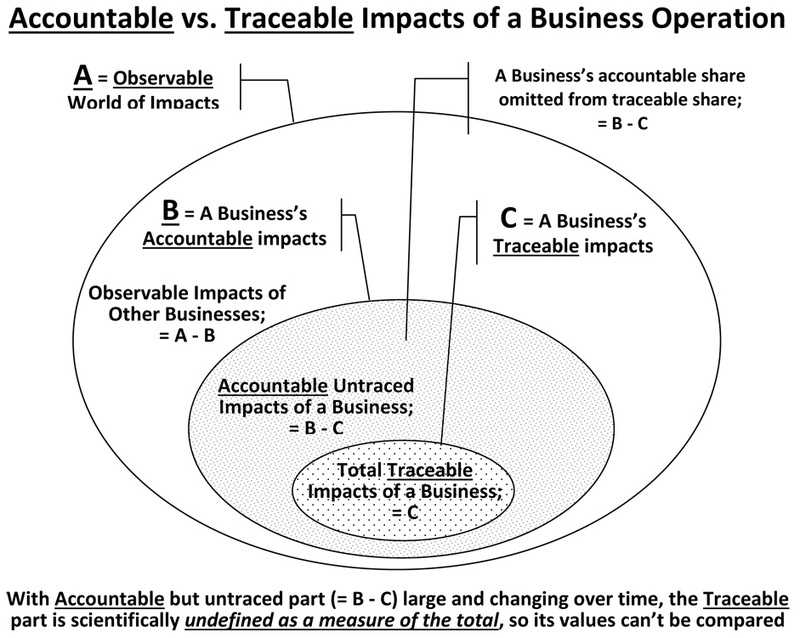 In the figure below, to use impact measures accurately to compare "before & after" for example, and also be sure of accounting for the Observed world of impacts 'A' , an accounting estimate for the Likely total as a share of the world total 'B' needs to be compared with the Traceable impacts total 'C'. Without a way to estimate the untraceable part of the impacts attributable to a business that creates the demand for them by employing them to operate, enormous errors are made, often to "outsource" more and more impacts that won't get counted... thinking of it as a sustainability plan. Using the small directly traceable part is simply invalid as an indicator of the total. For sustainability our requirement is to “work with nature”, not to mismeasure nature to improve "the bottom line" using ill-defined measures. It’s really long past time to talk about how to define our units of measure, and the scientific implications. More accurate and truthful measures both greatly simplify some parts of the larger problem, and change some of the terms of discussion… (with what is also an extremely cool bit of useful hard science) pointing us in the right direction. What you want to know is who pays for impacts, as their cause, not where they are produced. It's controversial but also unavoidably true that it's generally paying for things that causes their environmental impacts. Theoretically money is just a symbol, but it has value because we use it to make requests, using its property of being a reliable unit of credit for whatever the world can produce, *at your request". It means that physical causation in economies "follows the money" as the demand for services that money conveys, as credit information. 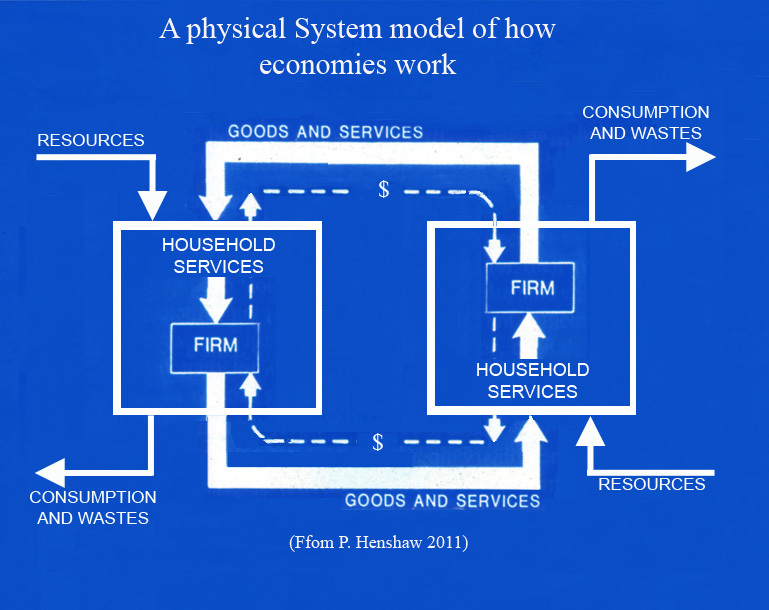 Converting money into a well defined "soft measure" of total environmental impacts is then made possible by recognizing that the economy is a truly global system of interconnected and interdependent parts. That makes the correct starting point for estimating a business's share of the economy's total impacts, environmentally, is its share of the total economy, financially. This holds up wonderfully on closer inspection, once you start counting the environmental impacts of all the business services requested by paying for them. That is the part of the total that most people have ignored so far, not thinking of business impacts as including what it takes to deliver business services. Taxes and Tariffs might be assessed on the total impacts that businesses pay for, or only for the impacts of the value added to business products, assuming all other businesses are paying their share too, to eliminate double payment of impact taxes or tariffs. Taxes might also be assessed even more simply to consumer demand, as a share of GDP and global demand for the impacts of the economy. The revenue would be the same, and the problem of deciding what to do with it the same, but I think businesses would understand the business choices better, and consumers the cultural value choices better, and so impact taxes would be more useful if applied to producers rather than consumers. It's highly valuable to find dangerous mistakes that are correctible. How DO we reduce our economic footprint? An accident of history resulted in way resources consumed by machines are measured, an efficiency measure, to become our standard way of measuring the environmental impacts of business. That leaves out the consumption of the people that run or serve a business, such as by operating the machines. 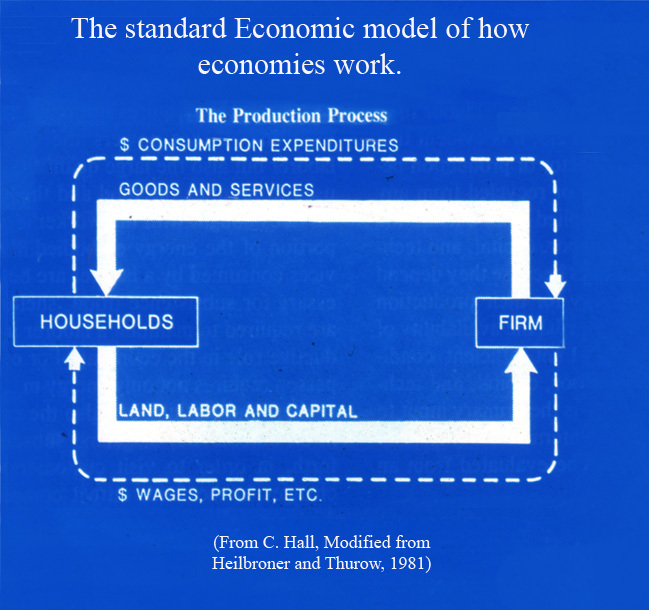 Economists were accounting for paying people or purchasing services only as an exchange of money, as if decoupled from what the money was used for. How the energy used by businesses has been counted is by just adding up the traceable energy uses of business technology. That overlooks the energy uses throughout the economy consumed in delivering business services. A statistical method is needed, because they are spread throughout the economy, paying people on the long chains of services needed by business. Those chains all end in paying some person for their normal consumption, as the end users of the business payments, made for their part in delivering the end service a business needs and pays for. That exposes a giant "technical definition error", of confusing economic measures and environmental measures. That's what SEA discusses and provides a fully rigorous physical systems science approach to correcting. The new approach to environmental impact accounting is both far more accurate and much easier. The useful conceptual finding is that the services delivered by any dollar, or in the used of any dollar, are widespread throughout the whole world economy, making the use of any dollar need to be first assumed responsible for an equal share of the whole world economy's impacts. more and more technologically efficient. The total energy cost to the economy for operating businesses is really on the scale of five times what was previously thought. What was overlooked are the large untraceable energy demands of the support services needed to obtain and operate technology and deliver products. They don't record or report their energy needs so businesses haven't been accounting for them. Per $ of business, the total liability for both visible and hidden energy use impacts, like for CO2 pollution, energy resource depletion, and for employing the energy obtained for altering the earth, are then also on the scale of five times what was previously realized. The error was picked up because the individual business energy use totals were adding up to be way below the world average energy use per $ of GDP. 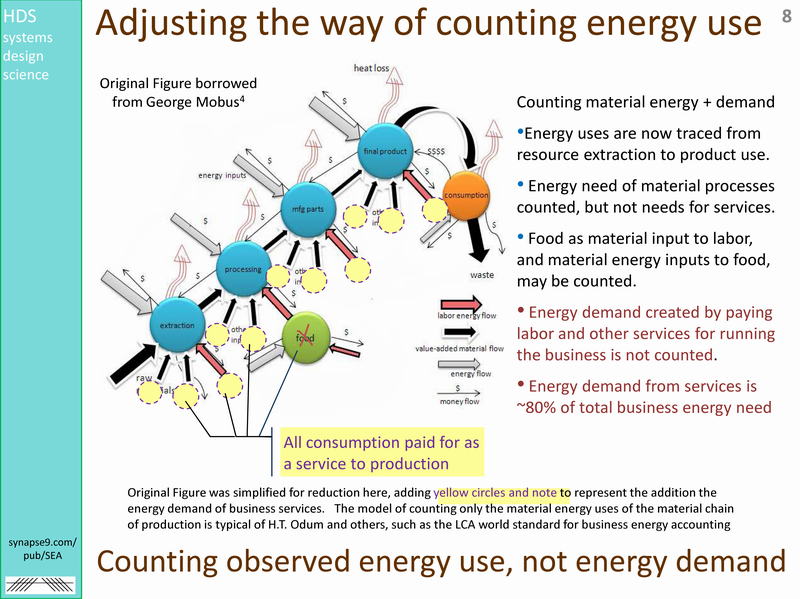 The accounting mistake was to count only the reported energy uses, counting the energy for necessary but unreported energy uses as "0". Because all spending ends up as personal incomes and consumption in the end, it's accurate to first estimate any energy demand per/$ as the global average. Especially environmentalists, green policy advocates and sustainable designers have been tricked into believing more efficient technology reduces total energy use, as if only a business's visible energy uses were the problem. The real problem is the far larger hidden ones. Complex theories are not needed to confirm this, just the oldest rule of science: "For complex subjects, find the unusually simple questions you can answer with high confidence". A new method of doing global energy accounting simplifying things a lot, actually, from having to correct a very major omission in the standard accounting method for environmental energy accounting. Businesses now count up all the fuel purchases they make, and add the fuel purchases of their *producer product* businesses in their supply chain. They have NOT been counting the energy uses they pay for as a cost of business for the businesses offering *producer services* in their supply chain, only those for producer products. So... that results in under-counting the total energy demand by nominally ~80%. How that simplifies things is that, ironically, producer services don't even record their energy uses. 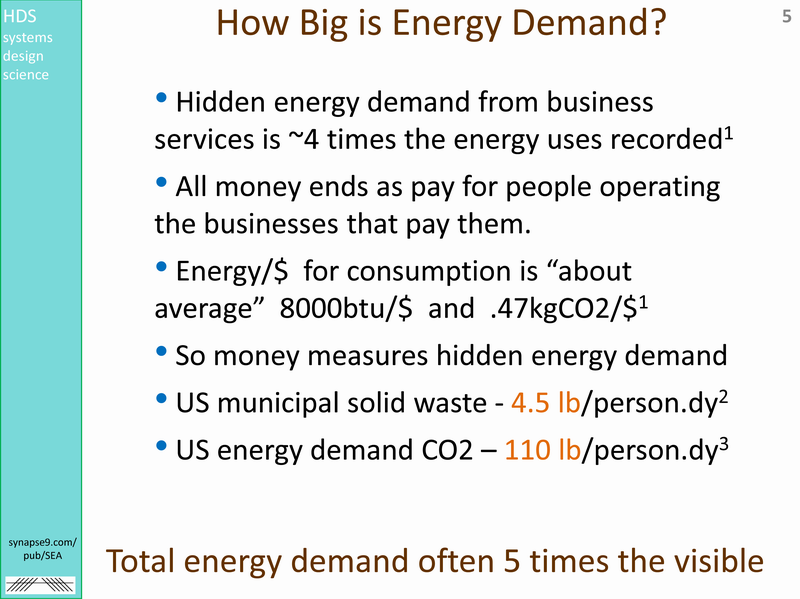 So you can only estimate them by the amount of money they are paid, and absent other information need to consider their energy impact to be "about average". That hugely simplifies everything, but takes a while to understand, starting with how the global average energy/$ is a very stable ratio, and can be known fairly precisely. 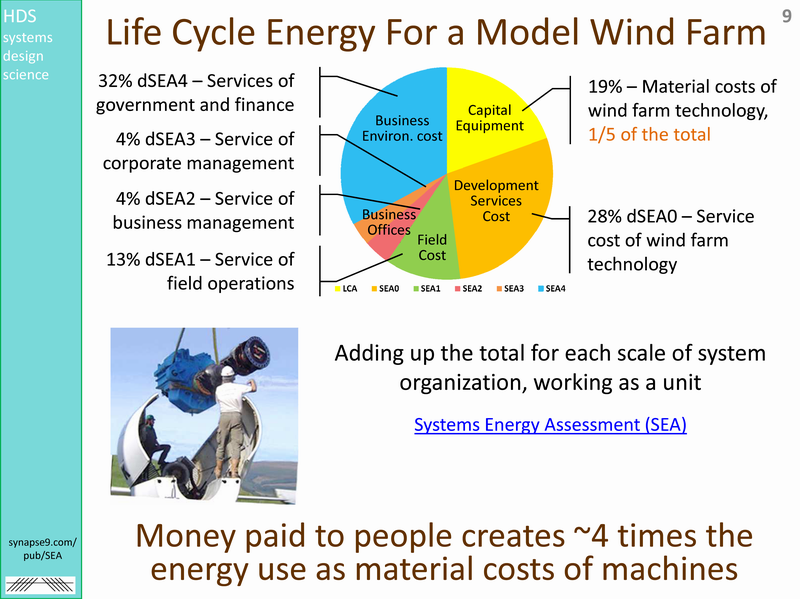 The Systems Energy Assessment (SEA) research paper shows that when you go to a great deal of effort to combine both ways of measuring, the exact accounting of the standard method is off by 500% and the quick method, using 8000btu/$, is only off by 15%. That using average spending habits rather than searching for records of energy uses FAR more accurate. For example, a business will count the economic benefit of expanding the community that gives them development credits, causing the increased housing, commerce, infrastructure and services that the income to the community generates. Those large energy and other environmental impacts are all counted as business development benefits, but not counted for government environmental monitoring, using standards like the GHG protocol or the common measurement method LCA. I'd be interested in what anyone thinks. I’m a research scientist who has spent 30 years developing methods for describing and predicting the physical behavior of complex environmental systems. I’ve made some good progress too, but it is not being well utilized. The proofs are not so hard, just the unexpected questions that disregard popular myths, that then become quite simple for anyone to answer. Because of what old myths fall away it’s kind of unpopular. Because we live in a natural world, though, it will have both technical and legal implications, that people will try to avoid , but eventually won’t be able to. I’d be delighted to follow up with your research staff. It could be quite important. 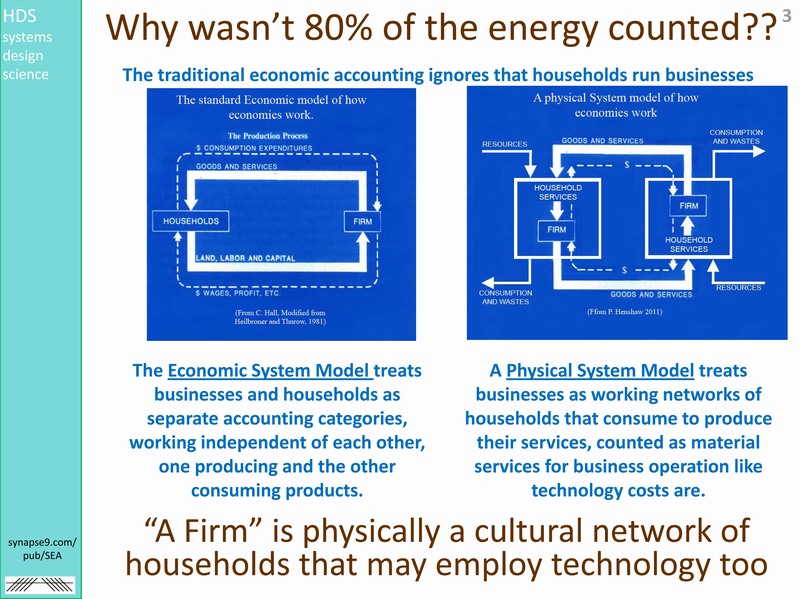 One of my recent findings concerns a flaw in our method for business energy and resource use accounting. Simply said, the standard method counts the traceable energy uses businesses pay for, often ~20% of the costs of running businesses. However, 100% of the costs of running businesses are ultimately traceable to the end user consumption of people at the ends of every supply chain, being paid for their services as a cost of operations. Most of those energy and other resource uses, then, are not counted by the ISO14000 and LCA application standard. 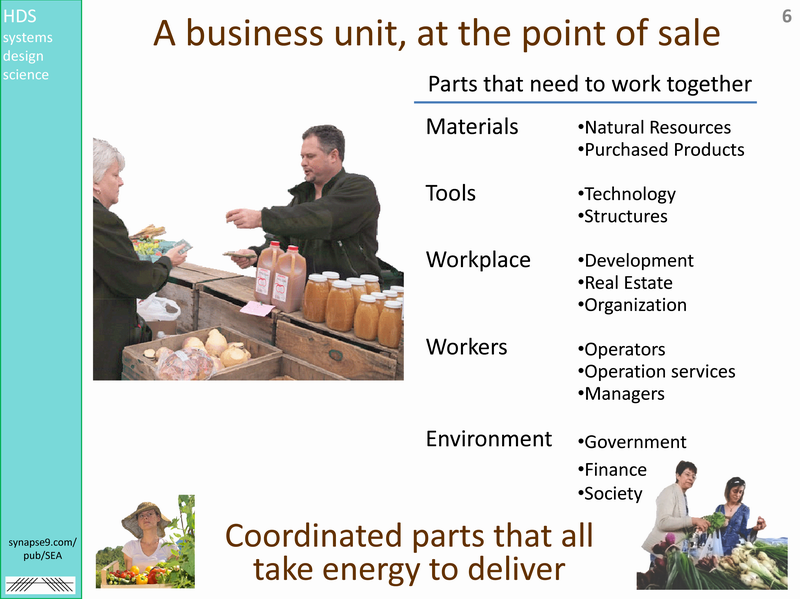 For common types of businesses it causes an ~80% undercount of resource use. I developed a sound method for correcting the problem, to be published in a pending special issue on resource accounting in Sustainability (MDPI). The paper is called, System Energy Assessment (SEA) and you can find my copy and a collection of supporting Slides & notes on my website. A pre-publication version is also in the Cornell physics archive arXiv:1104.3570v1 . It’s been a couple years since I figured out the problem. Everyone that looks at it has always agreed the method is valid too. The various professions it applies to are avoiding all effort to use of the new terms of discussion implied, however. It seems only if I was politically powerful would academics feel a need to change their work to reflect a better view of reality. Mother isn’t like that, of course, as everyone not being self-interested knows without hesitation. How it effects the “precautionary principle” is that the error makes it possible to claim one thing and do the opposite regarding business resource demand. So much of the outsourced energy and resource uses of business are not counted that just outsourcing more appears to be a reduction when it is the reverse. Thanks for all you and your organization’s work. We need the earth to work, not just our theories.